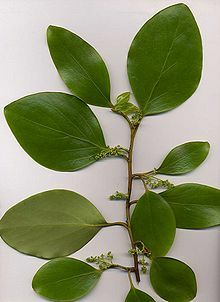 Griselinia littoralis, commonly known as kapuka, New Zealand broadleaf or papauma, is a fast-growing small to medium-sized evergreen tree that is native to New Zealand. Griselinia littoralis is a hardy evergreen shrub that grows up to about 10 metres tall. Griselinia littoralis is round in shape and has dense foliage. The leaves are alternate, leathery, glossy yellow-green above, paler and matte below, 6–14 cm (2–6 in) long, oval with a smooth margin. This tree also has flowers and berries that grow in particular seasons annually. In general, this tree can grow up to 10 meters or longer to 15 meters tall. It has rough and short branches which can stretch to 15 decimeters in diameter. The shape of apical leaf is broad-ovate to ovate-oblong or rounded with smooth margin. The yellow-green leaf is thick and its width can be 5-12 cm long by 4-5 cm wide, the leaf often be glossy and grow as alternative type, one side can be a little longer than the other side at base sometimes, this is one of the typical characters. The greenish flowers are borne on the slim twigs and they are quite small, they always grow up from late spring to mid-summer. The panicles of flower is small, too. Five petals are owned by the pistillate flowers. The dark purple or black berries can be 6-7 mm long and appearing in mid-summer and ripening from autumn to winter and the berries are small, too. Griselinia littoralis is native to New Zealand, but has also become located in other areas of the world. It is widely cultivated both in New Zealand and in other areas with mild oceanic climates such as the south coast of Great Britain, where it is valued for its tolerance of salt carried on sea gales. This plant is the native species in New Zealand and there is a large number of this plant in coastal area. In addition, this plant is fond to growing as screen to resist wind or other extreme situations. Griselinia littoralis is found throughout New Zealand from sea level up to 900 meters altitude and ranges from far north to Stewart Island geographically. It is most commonly found in coastal areas as it is a hardy plant. This plant is a native plant in New Zealand. It can be found everywhere in New Zealand from lowland to high hills or forest or shrub land. It can be found in larger quantities in the South Island than the North Island. In the North Island, it always grows at higher altitude than the South Island. Griselinia littoralis is native to New Zealand and is found throughout the country particularly in coastal exposed areas, as it is a hardy plant that tolerates sea breeze and wind exposure. Griselinia littoralis can survive a range of habitats and external conditions but prefers the following particular conditions and habitat. Griselinia littoralis prefers free draining soil as in light loamy type. This species tolerates temperatures down to about −10 °C (14 °F) and warm temperatures up to 35 °C (95 °F). Griselinia littoralis requires full sun or semi-shaded areas to thrive and will survive on very little nutrient like most native New Zealand plants, but will thrive in areas with the availability of higher nutrient levels. It favors high rainfall areas for good growth. This plant can grow at a lot of growing environments. In moist climates this plant might be an epiphyte with roots deep to the ground to absorb the water and nutrients. The flowering time of Griselinia littoralis is in spring when small greenish yellow flowers appear. The flowers are borne on 2–5 cm (1–2 in) long panicles, each panicle with 50-100 individual flowers, each flower 3–4 mm across, with five sepals and stamens but no petals. Following flowering, small blackish berries are formed, as long as male and female Griselinia littoralis are located in the same area so pollination can occur. Birds are a vector in spreading the seeds around the area, minimizing competition within the same species for water, sunlight and nutrients. Also allowing the Griselinia littoralis to establish in new areas. Germination of the seeds occur when the seeds drop to the ground and reproduction occurs. This plant has a long life span generally over fifty years. There are three phases of the forest growth cycle: the gap phase, the building phase, and the mature phase. It is easier to tell from these three phases. The diameter grow faster during the gap and building phase (0.31cm per year) that the leaves become bigger and bigger to absorb the sunlight to do photosynthesis than mature phase (just 0.19cm per year). Broadleaf grow very quickly in building phase than other phases. The gap phase is the period when the colonization forming by the canopy opening. The building phase is the period when the seeding attain canopy status. The mature phase is the period when the canopy keep intact. The average height of this plant is 15 cm per year (range 10-18 cm). The flowers are borne on the slim twigs and they are very small, the color is green, they always appear from late spring to mid-summer. Greenish flowers have two type: male flowers and female flowers. They grow up at different trees. The wind and insects are good media to transfer the pollen from one flower to another flower. Fruits keep green until they get ready to become mature and fall down from the tree to the ground. The dark purple or black berries can be 6-7 mm long and appearing in mid-summer and ripening from autumn to winter. Griselinia littoralis is susceptible to grazing herbivores and predators such as goat, deer, possums and insects. These predators graze on the leaves of this species however Griselinia littoralis is generally a healthy and dense shrub that withstands foraging adequately. Griselina littoralis bark was traditionally used by Maori as medicine to treat skin infections before modern medicine became available. The name littoralis of this broadleaf species means "growing by the sea". Griselinia littoralis is commonly used as a hedge or screen as it is a hardy shrub that can be clipped back easily and looks good all year round with minimal maintenance. This plant is a good coastal hedge resisting winds, especially in harsh coastal environment. ^ "Griselinia littoralis AGM". Plant Selector. Royal Horticultural Society. Retrieved 2012-03-19. ^ "NZ Flora". NZ Flora. Retrieved 6 May 2018. ^ Allan, H.H (1961). Flora of New Zealand. ^ a b c d e f g Dawson, John; Lucas, Rob (2000). Nature guide to the New Zealand forest. ^ "Plants for coastal areas". Gardening advice. Royal Horticultural Society. Retrieved 2012-03-19. ^ a b c d Matthews, Julian (1983). Trees in New Zealand. ^ a b c "Encyclopedia of life". Encyclopedia of life. Retrieved 6 May 2018. ^ Salmon, J.T (1980). The Native Trees of New Zealand. Auckland: G. Walker. ^ "Griselinia littoralis". Practical Plants. Retrieved 6 May 2018. ^ a b c "Griselinia littoralis". Texture Plants. Retrieved 6 May 2018. ^ Watt, A.S (1947). "Pattern and process in the plant community". Journal of Ecology. 35: 1–22. ^ Smale, M.C; Kimberley, M.O (1993). "Regeneration patterns in montane conifer/broadleaved forest on Mt Pureora, New Zealand". New Zealand Journal of Forestry Science. 23 (2): 123–41. ^ a b Moore, L.B; Irwin, J.B (1978). The Oxford book of New Zealand plants. ^ "Griselinia littoralis (Broadleaf, Kapuka)". Terrain. Retrieved 6 May 2018. This page was last edited on 12 April 2019, at 21:31 (UTC).